Today we’re pleased to announce the availability of Realm Mobile Platform, Developer Edition, on Microsoft’s Azure Marketplace. 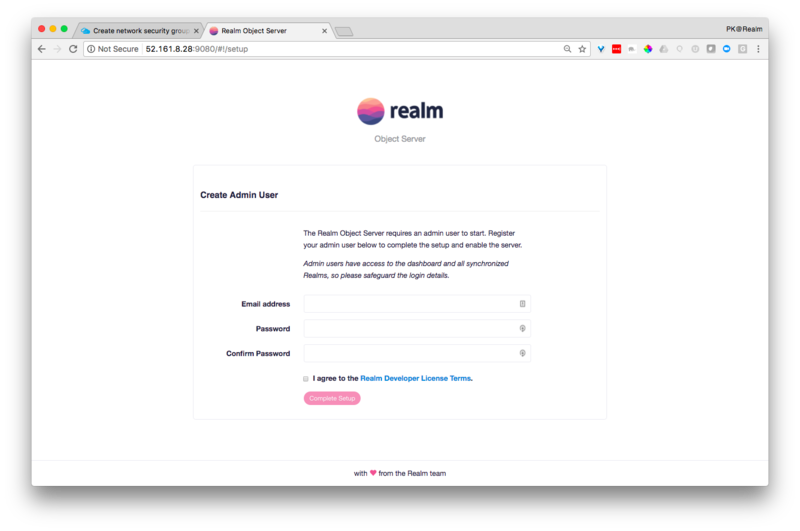 The Realm Platform has always been easy to install — we offer a Linux and Mac version, a public AMI for Amazon Web Services, and detailed instructions for Digital Ocean — but if you have an Azure account, this is by far the easiest way to get started. You simply find us in the Marketplace, and in a few clicks (see the steps below), you can have your own instance of Realm’s Developer Edition immediately available. It’s free and you can use it for almost anything – though of course fees for Azure may apply. This is really just the beginning — we’re now an official Microsoft partner, and are working on making the other Realm Platform editions available on Azure. And we’re on the same path with the other major cloud platforms as well, so stay tuned. Sign into your Azure account (or create one), then click the green plus sign (+) on the left to get access to the Marketplace. Enter Realm in the search box and choose the result. 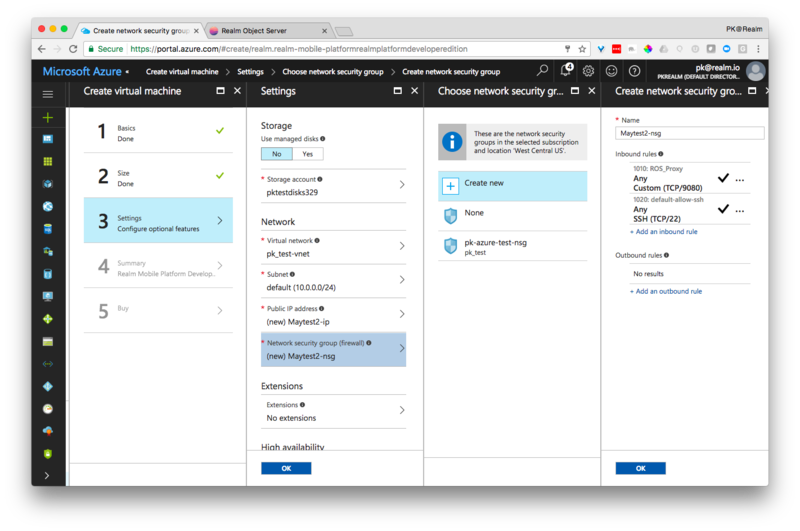 You’ll be walked through Azure’s quick and pretty straightforward five-step process to get your server configured. The necessary ports for Realm — 9080 and 22 — are preset. Other than naming things and setting up SSH, you can pretty much accept all the defaults. Following step five, it takes a minute or two for deployment, after which you’ll see the details of your new server, including the IP address. Open a new tab, copy that into the address bar, add :9080 to the end, and hit enter — you’ll see the Create Admin User panel for your shiny new Realm Object Server instance running Azure. Success! Now you are ready to start exploring the platform — start with one of our fun demo apps, like Realm Pop (realtime gameplay), Realm Draw (realtime collaboration), or Realm Tasks (realtime task management). Realm ObjC & Swift 2.7: Permission APIs, Fast Reconnects, Password Change & Bug Fixes!